Simpson Strong-Tie® coupler nuts are a tested and load-rated method to join threaded rod and anchor bolts. The Witness Hole™ in each nut provides a means to verify when rods are properly installed. The positive stop feature helps ensure even threading into each end of the nut. The CNW exceeds the specified minimum tensile capacity of corresponding ASTM A36 bolts and threaded rod. The HSCNW exceeds the specified minimum tensile capacity of corresponding ASTM A449 bolts and threaded rod. Contact Simpson Strong-Tie for other coupler nut sizes. Tighten the two rods until each all-thread rod is visible in the Witness Hole. Any portion of thread visible in the Witness Hole is a correct installation. Standard CNW for use with non-hot-dip galvanized all-thread rod only. 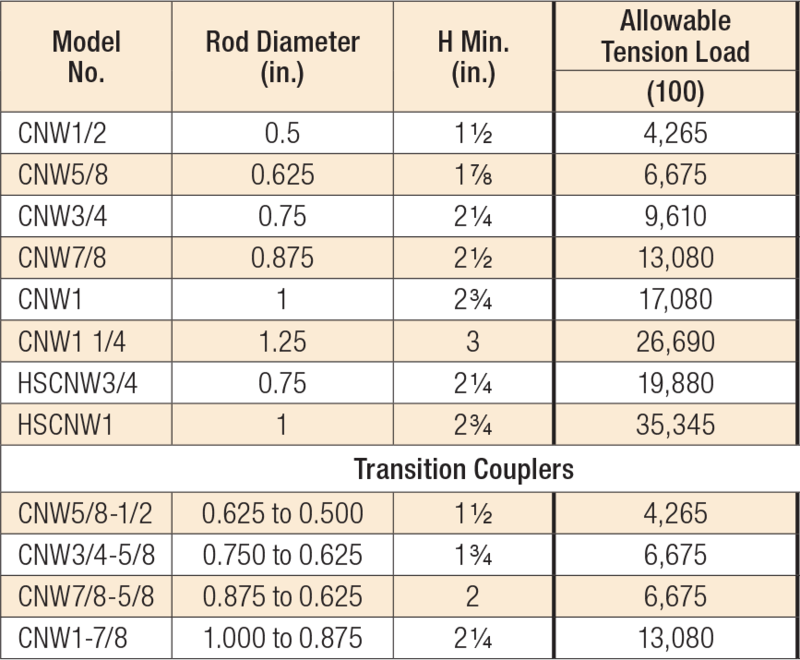 5/8"- and 7/8"-diameter couplers available with oversized threads for installation to hot-dip galvanized bolts (order CNW5/8-5/8OST and CNW7/8-7/8OST). Some OST couplers are typically oversized on one end of the coupler nut only and will be marked with an "O" on oversized side. Couplers may be oversized on both ends. Contact Simpson Strong-Tie to order. Allowable loads shown are based on AISC 360 for A36 and A449 (HS) threaded rods. CNW See specific model numbers for code listings. CNW-OST No evaluation report listing. CNW1 No evaluation report listing. CNW1-1/4 No evaluation report listing. CNW1-7/8 No evaluation report listing. CNW7/8 No evaluation report listing. CNW7/8-5/8 No evaluation report listing. HSCNW No evaluation report listing. HSCNW1 No evaluation report listing. HSCNW3/4 No evaluation report listing.